First of all you will need to get yourself a GBA ROM file. These files are not available to download from the Romhack.me site, so you will need to find them on your own. Make sure that the ROM file is untouched and unmodified. Next, you will need to get yourself an IPS Patcher such as Lunar IPS. It’s available for download here. 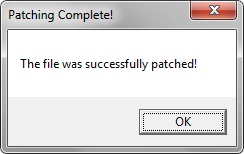 Once you have the IPS Patcher, you will need to download the IPS patch you want to patch. Once you have your GBA ROM file, the IPS patch and the Lunar IPS Patching Software you are ready to go. Open the Lunar IPS Patcher, and press the Apply IPS Patch button. You will be asked to select the IPS patch to use. Browse to the IPS patch. Then you will be asked to select the GBA ROM file to apply the patch too. Browse to your Untouched GBA ROM file. Once you have selected the ROM File, your IPS Patch will be applied to the ROM and ready to play.